Next we made our way to visit Lisa Comfort at Sew Over It. This is a gorgeous shop, it is so cute and pink and filled with all things sewing! It also has a delicious sewing cafe inside where the cakes are made by local bakers. Lisa fell in love with sewing when she was 11 and made her first skirt. A year later her parents gave her a sewing machine and she has never looked back since. Lisa started Sew Over It in a response to the growing feeling that sewing was becoming a lost skill. Lisa hopes to pass on her passion for sewing through Sew Over It and encourage more people in London to pick up a needle and thread! Meet Lisa in the video interview below and learn about her most recent project – the launch of her first sewing book! 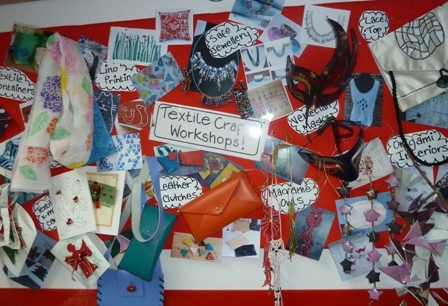 Take a tour of Sew Over It and check out inspirational projects students making in the video below. Sew Over It consists of an upstairs shop and sewing class area as well as a gorgeous downstairs sewing room which is just so pretty in pink! 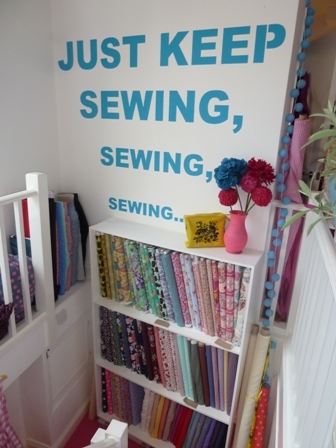 Great feature wall – Just Keep Sewing, Sewing , Sewing! 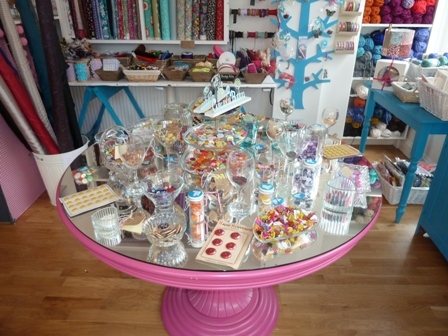 A table full of buttons and haberdashery that trick the kids into thinking they are sweets! 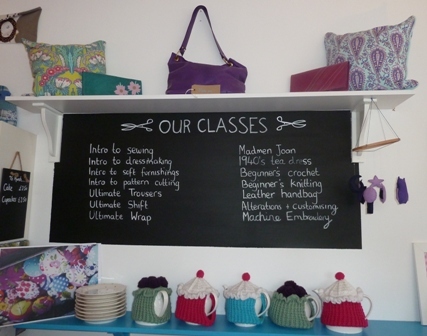 Sew Over It – range of sewing classes available. 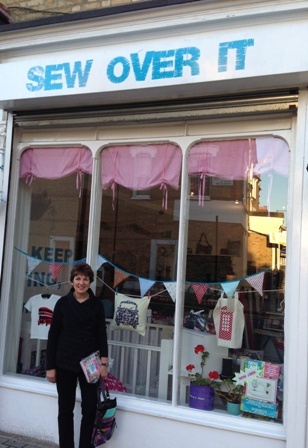 Thank you Lisa for a lovely visit to Sew Over It, we look forward to visiting again soon. 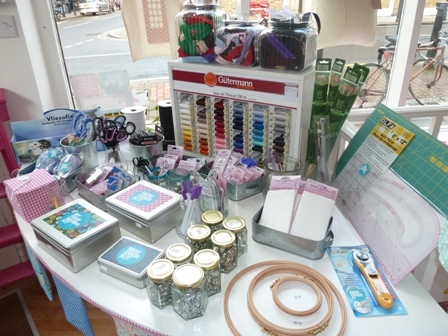 We highly recommend visiting Lisa at Sew Over It to join a sewing class, enjoy a cup of tea and cake and look through the assortment of fabrics and haberdashery! Please leave a comment below for us and Lisa, we would love to hear from you, how you liked this blog post, perhaps a special sewing project you’re currently working on or are inspired to make. Also if you’ve been to Sew Over It too or if it’s now on your list of places to visit! Stay tuned for our next stop on our London 2012 Sewing Tour coming your way soon! Our next stop on our London 2012 Sewing Tour was to Saturday Sewing Session. It was here that we were greeted by the lovely Arianna Cadwallander! Arianna Cadwallader, spends much of her time creating bespoke wedding dresses and headpieces. She has a background in fashion publication and film, having worked in high-end glossy magazines and the costume department of some much loved feature films including Bridget Jones Diary 2 and Harry Potter 4! Wow! In the video below I interview Arianna over a cup of tea as she tells us all about working on major films and her inspiration behind creating Saturday Sewing Session. 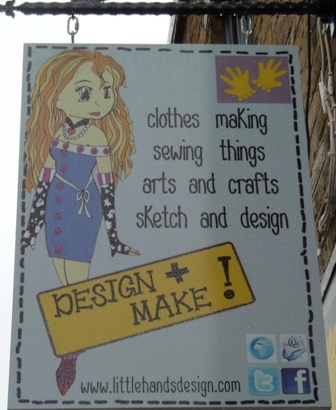 Take a tour of Arianna’s sewing studio and learn about the classes and workshops she offers. 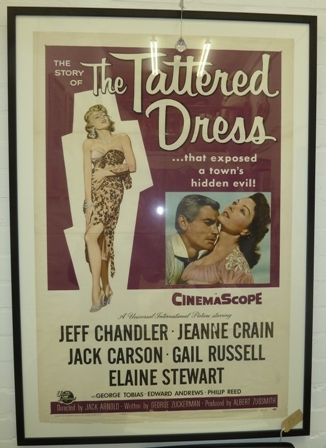 The Tattered Dress – framed by Arianna’s father. Thank you Arianna it was just delightful to meet you and visit your gorgeous sewing studio at Saturday Sewing Session, we look forward to visiting again soon! We highly recommend visiting Arianna at Saturday Sewing Session next time you’re in London or book into a class or workshop! Please leave a comment below for us and Arianna from Saturday Sewing Session, we would love to hear from you, how you liked this blog post, perhaps a special project or hat you’re working on! Also if you’ve been to Saturday Sewing Session too or if it’s now on your list of places to visit! I just can’t believe the fantastic time I’m having on our sewing tour. Each day is filled with visiting wonderful places and meeting gorgeous creative people! I’m pleased to share our 5th stop which was to Little Hands Designs. 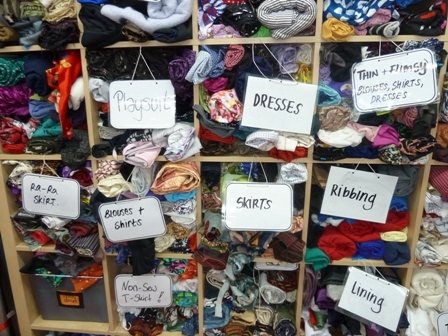 It was here that we met with the director Astrid Jacoby and even got to spend some time assisting students in one of Astrid’s sewing classes! 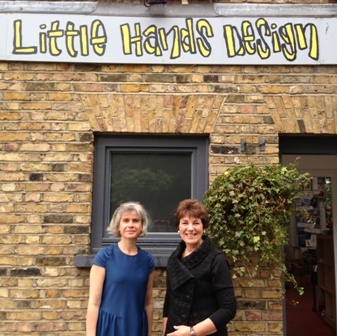 Astrid and her team at Little Hands Designs help students from 8 to 88 years, develop their own style, experiment with different materials, design with or without dressmaking patterns and master the sewing machine. Little Hands finds its niche in providing students with practical skills and a way of approaching problems which enables them to find solutions for themselves. Their work is project based and students are taught skills and are encouraged to approach any difficulties along the way which are then universally transferable. 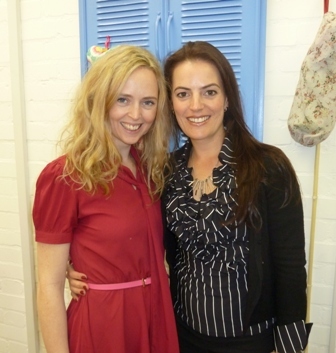 In the video below we interview Astrid about her sewing school at Little Hands Design. Astrid takes us on our tour around her sewing school to see the amazing designs and creative projects she challenges her students to make! In the video below one of Astrid’s sewing students Helen shares with us a gorgeous skirt she made! Helen also shares with us a dress she made at Little Hands Design – just beautiful! Hilary is in the process of making a new garment in her sewing class at Little Hands. Watch the video below to see what it is! Melanie is in the planning stage of making a pretty new apron for her daughter. Watch the video below to hear about the ideas we came up with and a sewing tip too! Thank you Astrid and her students for a fantastic visit to your sewing school, we look forward to visiting again soon! 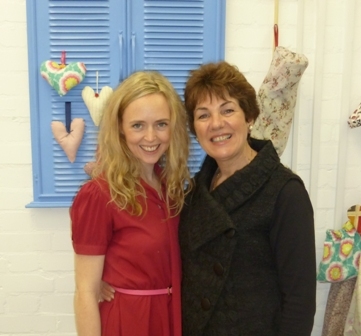 We highly recommend visiting Astrid at Little Hands Designs next time you’re in London or book into a class! Please leave a comment below for us and Astrid, we would love to hear from you, how you liked this blog post, perhaps a special sewing project you’re currently working on or are inspired to do next. Also if you’ve been to Little Hands Design too or if it’s now on your list of places to visit!